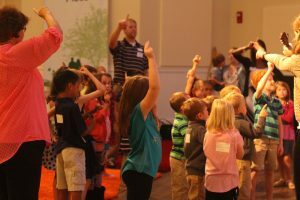 Children ages 3 through 3rd grade have their own age-appropriate worship service in the chapel. Children begin seated with their parents in the sanctuary at 11am, then after the “Time For Young Disciples,” we walk to the chapel. Children sing songs, collect offering, learn a Bible lesson, play a game, pray, and discuss the Bible. Volunteers are needed on a once-per-month rotation to help supervise and guide children through the activities. No planning or preparation needed. Children older than 3rd grade are welcome to be helpers alongside their parents.